1. What truly BIG A DEAL the Sea Hunt Forever show is for our diving community. 2. How much time and effort goes into producing videos and photos to post on forums that only a few people bother to contribute anything to... Comments, questions, personal experience, etc... Much less share and disseminate outside the forum for the good of the sport. - Sea Hunt Forever showed off in broad daylight (and with over 5,800 witnesses) over 160 vintage equipment dives without a single failure of the vintage scuba diving equipment. - Sea Hunt Forever showed the vintage style of diving with no BCD, no Octo, no gauges, no computers... over 160 dives with no incidents from running out of air, no buoyancy problems,... No problems at all. - Sea Hunt Forever showed off a definite "cool factor" of scuba diving that influenced more than a few of the visitors to want to take up scuba diving. We over heard this often as guests came off the boats. - The Sea Hunt Forever CAST made a terrific contribution to the diving public and to the prosperity of the Silver Springs Park and surrounding community by putting on this demonstration. Everyone paid all of their own expenses and donated as much as a week of time for not only the show but the travel to haul all of the equipment down there. And almost all of the divers stepped outside of their comfort zones to walk around in their equipment, visit with the guests, answer questions, let people take their pictures, etc. - The organizers of Sea Hunt Forever contributed even more... Allan Klauda set and enforced the true-to-Sea Hunt equipment requirements and helped the cast coordinate assembling everything they needed. Allan made and brought the props... Anaconda, rubber knives, fake spearguns, etc. Bryan Pennington put in 12 months of negotiating and organizing and meetings with park officials and others, handled legal issues, waivers, assembled the cast, arranged the lodging and meals, arranged the power for the generators, etc. etc. Roger Van Frank brought along a beautiful, enclosed trailer based 8 CFM compressor system with huge cascade tanks and kept everybody's tanks filled. Bryan and Ron also brought compressors. - Alex Pierce hauled his entire Sea Hunt collection from Canada. It took 7 hours to set up and was enjoyed by the over 5,800 guests who visited Silver Springs that weekend. The depth and potential influence of the Sea Hunt Forever event is definitely significant. I am very proud to have been part of it and I think the Vintage Diving Community can take great pride in it as well. Does having to pull my J valve twice count as running out of air. Eben, I too would like to see more comments, stories, etc.. regarding the show and vintage diving in general. We all worked our asses off and it is always nice to get feedback (hopefully good but constructive criticism doesn't hurt). Please forgive the following disjointed rant but I'm sitting here at a coffee shop drinking way to much coffee and had the following random thoughts. Your opinions may differ. Without giving it too much thought the way I see it is there are far more lookers than contributors to the forum topics. I think that is true of most forums. Even one person posting a photo has the ability to reach everyone on the planet with an Internet or mobile connection. That said, more, more, more please! 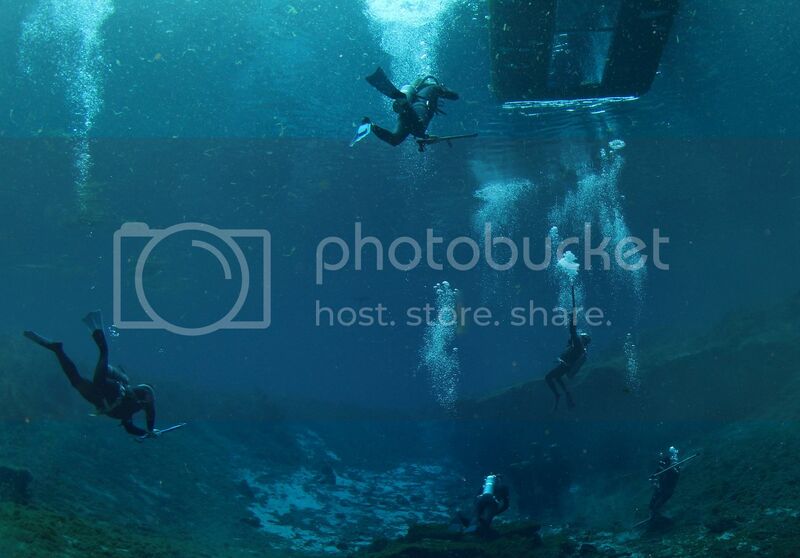 Ours is a small niche community in the grand scheme of all things diving. Not only were we diving vintage, we were diving Sea Hunt vintage, an even smaller niche. What with all the Phoenix, Cyclone, and Argonauts out there modern style DH diving is growing by leaps and bounds and I think that is great. I dive modern DH all the time (DH, BC, pressure gauge, computer...). Not that I have a point, but I guess what I'm trying to get at is to come up with a way to educate today's diver about our history so they can gain appreciation of where we evolved from (devolved from?). Most dive shop personnel I speak with have never heard of Sea Hunt and a few didn't even know there was such a thing as a double hose regulator. It certainly isn't a topic being taught in most basic scuba classes. I was really encouraged by the tourists at the show who, after seeing the divers, expressed an interest in learning to dive. 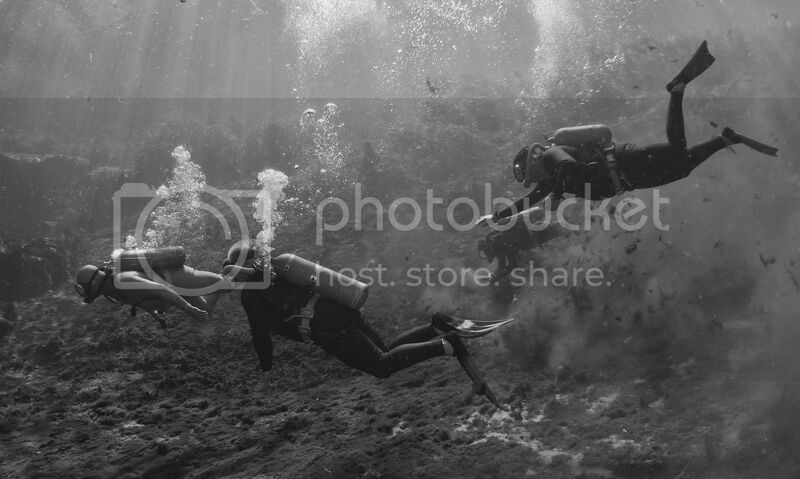 One guy said we made diving look "adventurous and romantic" kind of like he felt after seeing a Humphrey Bogart film. Well said! So maybe that's the ticket. Figure out a way to show the romance and adventure to new and existing divers and expand that audience to people for whom the spark of adventure is ignited and make them want to learn to dive. I know we provided that to over 5000 people earlier this month. Not every one is going to become a "vintage diver" but I don't believe that is the point. If I can make people feel what made me strap a pillow on my back with a belt, put a mask on my forehead and swim through my parent's living room in front of a black and white TV then I've succeeded. I believe we did just that at Sea Hunt Forever. I've probably posted these pics of me before but they give the sense of what I mean. The above is my DAILY frustration with the VDH Forum......Google analytics tells me the huge number of visitors it receives daily but the amount of participation it gets is a joke. I have often considered locking it down to future postings and simply keeping the reference sections for future use as very few really seem to care to use the forum for it's intend purpose. I'm not to that point but the thought crosses my mind more often than not. Sea Hunt Forever was done for several reasons and not the ones that you might think. I love double hose diving and sharing it with other people who are interested in learning and have an open mind about it. I love the Florida Springs and everything they have to offer not only the divers but for anyone who takes the time to visit them. I love seeing divers/customers/friends ENJOYING the fruits of their hard work, research and training in a place that they can share their passion for what they are doing with thousands of people. The divers in this group were all without exception professional and to a T were great examples of what a fascinating and lifelong hobby scuba diving can be. I care absolutely nothing for seeing my name, face or comments I make in print, photos or on TV. I would much rather pump air, fix gear do logistics than be on the front page. I do take great pride in reading and seeing what others do and it gives me a great deal of satisfaction knowing that I helped them get there. Each time I visited the diving dock and saw all the smiling faces of both the divers and the crowd I knew I had done something special. In 2016 I lost my shirt on the event......So in 2017 I had to pass almost all the costs on to the cast members.....Didn't like doing it but it was either do it that way or don't do the event at all. I've received several E-mails from folks who are P.O'd because they were not invited to be a cast member...."I've spent $$$$$ with you and how dare you not include me" My response to one and all is....I don't care if you've spent a dollar or a dump truck full of quarters with me.....Sea Hunt Forever is about the passion the divers have for what they are doing not about the $$$. Many of the returning cast members saw that in spades out of the new cast members.....When and if I do a similar event again the roll call will go out to those with enthusiasm, passion, participation and a desire to share our part of the diving world with others. BTW....After the 2016 event and so far in 2017 no one has called me up and asked to buy a gozillion dollars worth of vintage gear but maybe .....just maybe the Sea Hunt Forever divers planted a thought in the heads of a few of the kids they entertained and at some point I hope they decide to become the future generation of Mike Nelsons. Even though I was not able to make it this year , I feel blessed to get the invite. The Sea Hunt Forever program is very special to me. Bryan puts a scary amount of effort into making this thing work. I have a sneaky suspicion that Eva does too in the back ground. Even Peeps is working the crowd giving out stickers and such. She's a real trooper! Allan of course comes up with some wonderful props. Herman usually set things up during the event. I'm sure I'm missing people and for that I apologize. I have been involved with the club scene in diving since about 2002. I formed the Deep Six dive group in 2008. It's kind of like an Average Joe's Gym for scuba divers. We have a little of everything. Over the last several years I have noticed a sea change in participation in meeting and events. Our meetings used to get fifteen people. We used to be able to do camp and dives. We had ice dives every year. About the only thing left that has any draw is the summer picnic at my place which involves great food and a shore dive. Wreck dives if we can come up with boat space. Anyway, we just don't draw anymore.... for ANYTHING! It's really frustrating. I have trouble getting people up to Fortune Pond. Most discouraging. Has the time where people got away from their key boards, got off their dead arse and did something passed? I am beginning to wonder. My Father used to say, "I'm glad I was born when I was!" It makes more sense every year. Traditionalists - the 1%-ers..... I liken it to other hobbies I have. I like to hunt.... In participating, I use traditional bows as well as a modern compound. I use flintlocks/caplocks in addition to modern shotguns and rifles. Do I want to be a re-enactor or dress like a homeless person out in the woods? No, not particularly. But yet I do appreciate the "one shot" and not a bunch of additional advantages, honing my skills. While you guys were "putting on the show", and I totally respect and appreciate your passion, dedication, and effort, I was using a Kraken under 16" of ice where the air temperature was -13F in a full modern drysuit, & BP/W! Am I any better? No. Did I have fun? Yes! Did other divers there see "something different"? Yes! Did it spur interest? Hopefully..... (rumor has it a local newspaper article may happen with some of out photographs, and comments from the instructor)! I guess I need to ask, "What worship to you seek"? If you stirred one person to look into scuba (be it vintage or modern) at the "show", you won! If they go further and dig out old gear, you won x2, x10, x100! We are in a time of transition, where "passion" is substituted with "checklist". I don't know that it can be reversed, but we cant internally fracture ourselves further as it turns folks away. As Bryan contemplates "the future", we all must ask, "Are we doing this for fun, or something else"? If it is no longer fun, and the "other" reason isn't what we wanted, maybe it is time to change..... Being a 1%, I hope you don't seek more than self worth and enjoyment. You guys put in a ridiculous bit of time, effort, and money, but that is what we do with things we are passionate about. I am amazed at what you do! I hope none of you ever loose the passion. It is fun to rub elbows with you. I just won't be "you". "When I first joined this board (and still to this day), I don't feel like I'm worth anything to this group as I am "quasi-vintage". I'm stubborn, and until told to go away, I celebrate the elements of "vintage" and "quasi-vintage" I choose to do, hoping to expose folks to pieces of "the other side"..... Maybe from there they might become the 1%-er.... maybe not..."
Actually you are kind of like the definition of the CORE of this group! Sea Hunt is a little different because we are re enacting a TV show from 1958. Functionally though in "real life", the vast majority of us are diving rigs like you took under the ice. A little of this and a little of that. For instance, when I go up to Fortune Pond I will usually do some dives full modern tech. Then I might do a dive with my Kracken with a wing and back plate. Then I might dive my DivAir with a 72 and a slung pony to run my dry suit. There is a picture of me somewhere from about five years ago. I am down about 40 feet with a double hoser and I am next to a tech diver with doubles and pony tanks and next to us is a guy diver a rebreather. Your actually the rule rather then the exception. The next time there is an event you can get to like the get together in Ohio in September, come on out. Yes, you will see people diving 1958. But mostly you will see people diving a smorgasbord of different stuff. The only thing I can guarantee is that you will meet new and interesting people and have a blast! Even with well attended events by the public like Sea Hunt Forever, a couple of dedicated forums like this on VDH, and coverage from the likes of Jonathan Bird, we are niche players in the overall recreational diving scene. Also the diver training organizations and the mainstream diving equipment manufacturers cater to the safety = equipment dependence and the newest equipment is best philosophy, so again we are very much a niche as far as diver training and new products are concerned. Yes we demonstrate unique skills that most modern divers have never seen (or even believed were possible), but to the average diver who was never taught about diving without an SPG, BC, etc. we are and will remain outliers, as our skills are not necessarily something that they want to emulate, hell, most divers only want the easiest, safest, most superficial means to enter the underwater world, and the other niche players (tech, cave, wreck, cold water) have their own toys and heroes to play with and follow. I consider our group's use of vintage equipment my personal favorite kind of scuba diving, and promote it in my local diving, and on my diving vacations when possible. Just having an event for our niche where we can demonstrate our particular style of diving to the general public and recreational diving community is very cool, and a big deal (that I gladly participate) ; but I don't expect it to substantially increase the active participating membership of our diving community. That's what my local diving is for. Additionally, and certainly not least, is the vintage style and proprietary equipment (like the Kraken Argonaut and Phoenix valve) available to all via VDH. Divers looking to get involved with vintage diving can get a start by easing in through the purchase of a Phoenix valve and a DAAM, get an oval mask and other equipment unique to our kind of diving. Too DAAM Many double hoses, It's not a hobby, it's an addiction. From my side of the ocean, the relevance of the Sea Hunt Forever event is to use it as a showcase event - a ready reference to show potential double hose divers that the equipment and techniques are alive and well. With events like that, I'd like to think that each member is acutely aware of their role as ambassadors of this little niche of ours, and take great pains to get all the gear working right. Drado wrote: With events like that, I'd like to think that each member is acutely aware of their role as ambassadors of this little niche of ours, and take great pains to get all the gear working right. This picture sort of summarizes the "stage" and the audience for the Sea Hunt Forever 2017 production. I think you are seeing a line that doesn't exist. I don't think any of us see our selves as 1% of anything. It is sort of like being invited to a party, is it formal or costume, which ever you dress accordingly. When not at a party you wear whatever you want. I very seldom have dived totally vintage when on my own. I often make the point I am a double hose diver, not a vintage diver. Perhaps we should drop the "vintage" part and just become double hose divers. From that perspective you can chose whatever you feel like using or being on a particular day. I guess it is like everywhere else, but in this small community, it has a bigger impact.